"Give eyes a pop of sugary shimmer and creamy mattes with this French mararon inspired palette of nine sweet shades of vanilla, chocolate and candy coloured hues for eyes that sparkle and pop!" I don't think that it is any secret that I have kind of fallen in love with Too Faced cosmetics. Honestly, if I could afford to, I'd buy just about everything that they release in shades that suit me. I just adore their lovely quality, whimsical packaging and lighthearted approach to beauty. And for those who would roll your eyes and click your tongue and tell me that Too Faced is not for the more mature makeup enthusiast, I would say, "Nonsense!" Whether you are fourteen or ninety-four, beauty and having fun with it is for everyone. So lighten up and go put on a little glitter. 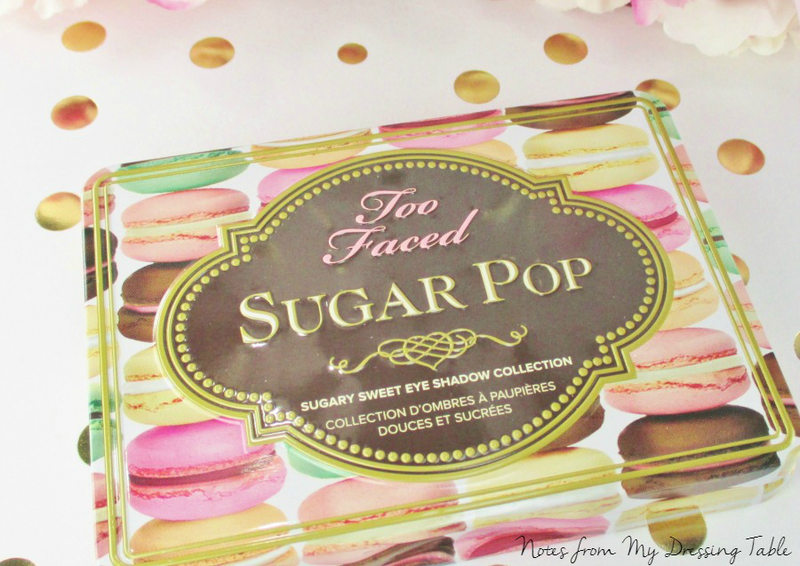 When Too Faced released their Sugar Pop Eye Palette I knew that I had to have it! I mean... Just look at it! That adorable tin palette covered in delectable French macarons, trimmed in gold and chocolate encasing nine sweet, wearable perfect for Summer and beyond eye shadow shades. 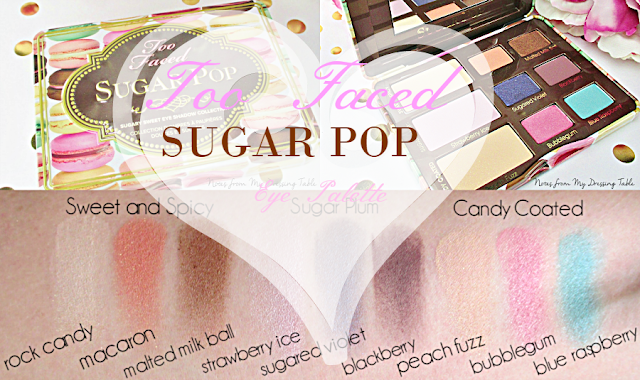 The Too Faced Sugar Pop Eye Palette has three larger pans of colour for all over lid and highlight work. I like to use that top highlight for face, too. There are six smaller more intense shades and tones in neutral and bright to mix and match to create an abundance of pretty and fun eye looks. There is also a decent sized mirror in the lid, in case you are applying your look on the run. I am so happy to see Too Faced stamping the shade names on the palette insert below each shadow pan. Every eye shadow palette from every brand should receive such treatment. Sweet and Spicy: Warm, a little more neutral. Easy to wear for work or every day. Sugar Plums: Cool and syrupy sweet. Perfect shades for evening or a hot date. Candy Coated: Tonal mix and pure fun! This is where you go to pop it up. This is your out with the girls eye. A day on the beach or at the fair with your sweetie, chomping on cotton candy... Yeah. Close up on the eye candy. I admit, I play favorites. Sweet & Spicy, Macaron, Malted Milk Ball, Strawberry Ice and Blackberry are some of my most often used shades. But I use all of them, in various ways. These shadows work together and they also play very nicely with shadows from other palettes. A very versatile and usable makeup item, to be sure. How'z about some swatch action? Because I know that you haven't seen any, yet. And I know that you can't get enough of my crappy swatch pics. Hey, I live to serve. I'm here for you. In my experience, all of these shadows perform at their best over an eye primer. Since I routinely wear primer, that isn't a problem for me. If you dislike primer and don't wear it, your mileage may greatly vary. Rock Candy: Ivory matte with a gold fleck. Semi sheer. Fairly smooth. This can be packed on to appreciate the sparkle or buffed out for a more matte finish. Hello highlight on brow and cheekbones. Macaron: Probably my overall fave in the palette. This juicy, bright tangerine with a floating gold shimmer is fairly soft, nicely pigmented. It can be buffed to create a self gradient or packed on for a more opaque true orange. Just. Gorgeous. Malted Milk Ball: Warm milk chocolate shimmer with a gold fleck. A little stiff to the touch but picks up nicely on a brush, applies and blends sweetly. I love this for crease and outer corner work. Strawberry Ice: Delicate, semi sheer lilac pink semi matte. This is so adorable packed onto the lid or buffed out as a brow highlight. 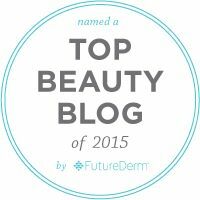 Best applied over primer for optimal payoff and wear. Sugared Violet: Pretty purple shimmer with a duochrome shift and a bit of a blurple fleck. This one is fairy soft to the touch but can be flaky and needs to be packed on a bit for best pigmentation on the eye. Wear it over primer or a base. Lightly misting your brush with a fixative is also helpful. Blackberry: This slightly dusty medium purple matte is soft to the touch, a bit powdery but not a problem child. This is a great fave of mine for crease and outer corner work. It applies and blends like a freaking dream. Is a tad fallout-y... Have a Q-Tip at the ready. Peach Fuzz: A warm, sheer peach matte with a gold fleck. It is kind of nice for transition with Macaron and Malted Milk Ball. 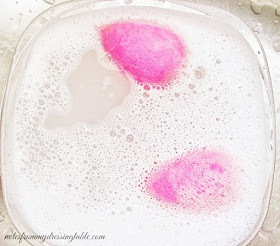 Bubblegum: This bubblegum pink satin with a silver fleck is so danged pretty. The shadow is soft and easy to apply and blend. I haven't really worked with this one much, yet. It is a very nice shadow, tho. Blue Raspberry: I love this one. But it got me into trouble. I'll elaborate, in a future post. This bright, matte aqua blue is a tad stiff and patchy but it is workable; you just have to be patient with it. A primer or base is a must. In spite of it's iffy quality, I kinda sorta, a lot love this colour and I just like to look at it. Overall, the palette is adorably pretty and wearable and I like it. I am reaching for this palette more often than I thought I would and I am enjoying wearing these shades on my eyes. I like this eye look I did the other day. It feels like a washed, watercolour effect and I will be doing a detailed how to post, soon. The Too Faced Sugar Pop Eye Palette is limited edition for Summer but so far is still widely available where you buy Too faced cosmetics. It is listed at Sephora, Ulta, Macy's, Beauty Dot Com, the Too Faced Website and wherever else you can find Too Faced in person and online. The palette contains 11.4 g of product and retails for $36.00. Too Faced Cosmetics are cruelty free. So, gentle reader. What say you about this sugar high for the eyes? Do you own it, yet? What do you think of it? If it's giving you a sweet tooth, will you be picking it up for yourself? You ladies are reminding me that I bought this the day it was released and never reviewed it heheh Love your pictures! I love TooFaced. They do have the most whimsical packaging and their products work so well. Their eyeshadow kits are my favorite. I saw this palette just today and the colors are awesome. Awesome on you too. Ugh, I keep holding out on buying this for whatever reason, and keep seeing post after post convincing me I NEED it. I like your attitude, makeup is definitely meant to be fun! 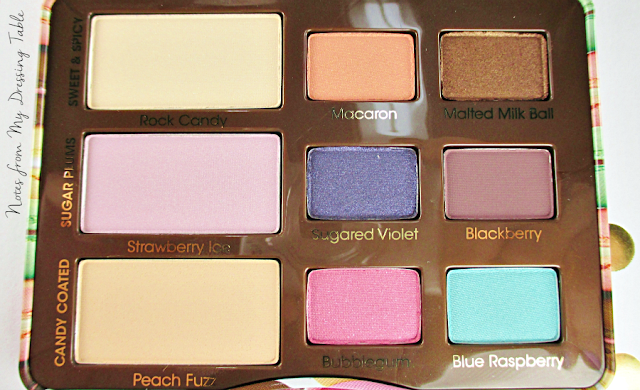 So basically, I'm a sucker for Too Faced too haha I love their palettes, and the bright fun shades in this are perfect for summer! I just bought their newest palette and I can wear it tomorrow because I got clean photos of the palette (though no swatches yet). I never thought I'd fall for Too Faced when they had those cardboard palettes years ago but they've got me now. This is such a fun palette! Every time I see Sugared Violet, I remember how much I need this palette..
Must. Have. Every single shade is gorgeous! Sugar Pop is so perfect for the summer! aaaaaaaah!!!! The colors are so pretty!!! I heart Too Faced. I guess I am going to have to break down and try this! 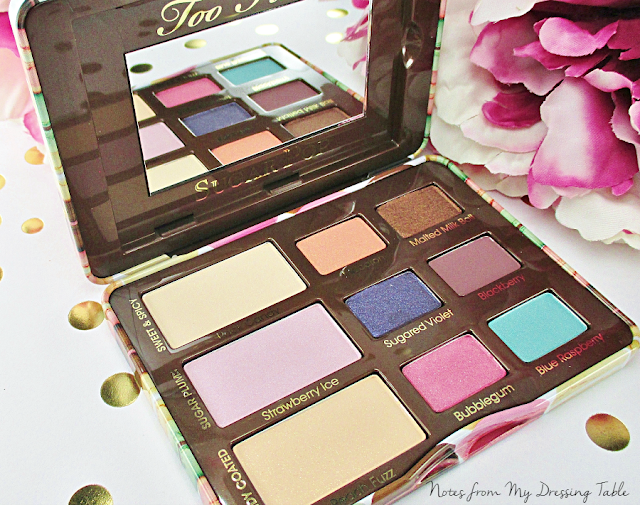 I just reviewed this palette a couple of days ago and I love it! i LOVE the watercolor effect on your eyes, it's a beautiful combination! Love the look you did! Too Faced is one of my favorite brands as well! Get it! It's so pretty and fun. I've really been enjoying it. I agree. I have one from last Summer. I like it but I never reach for it. I am using the stuffing out of this one. You need this. It would be so pretty on you, with your colouring. Yep! Yep! I am loving it right now. My husband picked this up for me- can't wait to play with this! I grabbed this and LOVE it! Isn't it lovely? Enjoy it! Oh, he's a good boy! You'll love it. The whole palette is wearable. You got the Love palette? I have that on my wishlist. It will be mine, soon! I have a little older palette of their's and it's just okay. But their newer shadow palettes are so much better. The quality is there. Than you. :D I don't think that we should box ourselves in. I'm so gone on Too Faced, lately, their stuff is so good. What are you waiting for? You'll love it. I know, right? Triggered my sweet tooth. Those macarons were half the reason why I bought that palette. The gorgeous shadows is why I kept it and love it. Thank you! Get to it. lady! Snap pics and get it on thy eyes. Those colours would look fantastic on you. This is such a perfect Summer palette. I love mine! So this palette is gorgeous. I need it! I keep seeing this palette everywhere and it's beautiful. I'm sooo tempted, but I don't *need* it, you know? But maybe I do *need* it. Ahhh, thinking is hard. Love the look you created. The shades in this palette are so fun.